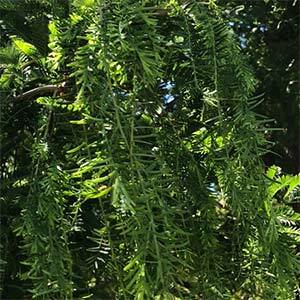 Once thought extinct, the Dawn Redwood was rediscovered in its native China in the mid 1940s. The plant is now protected by law in China. 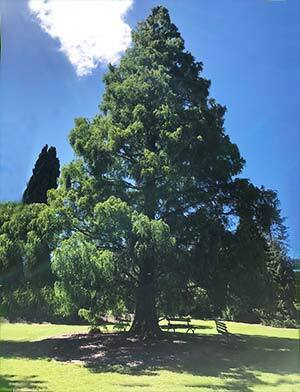 This is a deciduous conifer, fast growing and an excellent specimen tree for large gardens and parks. Some magnificent examples can be found in Tasmania in the arboretum at Eugenana, where it has the ideal climate and soil. It can be used to create avenue, or used in plantings in rural areas of golf courses. The bark on the trunk becomes deeply fissured over time, each tree produces both male and female cones. With a natural pyramidical habit and buttressed trunk this is a string and stately tree. This is a cool climate conifer, the best locations are in the foothill areas in cooler climates. A humus rich moist soil is best, good drainage is not so important as the tree will survive in wet soils, and even periods in standing water. This is a tree with a vigorous root system and in should be planted away from buildings, paths and roadways and drainage pipes. Give it 7 metres clearances a guide. Common Name – Dawn Redwood, Golden Ogi, Gold Rush Redwood. Soil – Well drained, moist and humus rich. It will survive in wet soils. Foliage – Mid to deep green with a very appearance. Turns a golden pink before dropping the leaves in winter. Pruning – Not generally required although lower limbs are sometimes removed for access.